In this world we talk a great deal about honoring and respecting—not to mention, thanking—all the hard work done by the police, firemen and women, and first responders. These people do their very tough jobs on a daily basis so that we can be protected. This is a very good thing; in fact, it is something everyone should do as often as possible. 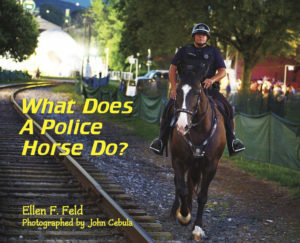 And this book not only reminds us all about the officers of the law and the difficult work they have, but it also opens up a brand new door to both kids and adults when it comes to the very “large” officers who just happen to own beautiful brown eyes, amazing coats, and have an affinity for the occasional apple. They are also the ones that kids absolutely love to get their pictures taken with. Need a hint? Not a problem. Introducing...Liam. Liam is a police horse who wears a real badge and has the job of serving and protecting his area of the world. Living in Lancaster and being an officer with the Lancaster, Pennsylvania Mounted Police Unit, Liam is one of the horses who go out on patrol each and every day. His partner is Officer Eric Lukacs, and the fantastic photographs of this memorable team will delight anyone who picks up this book. Readers are taken through Liam’s day, and are also introduced to Liam’s other co-workers. From Ozzy, Duke and Charlie—his horse friends—to the barking K-9 patrolman named Axel. Through words and pictures we are taught about the type of training Liam has to go through in order to learn how to handle obstacles that may “pop” up in his path during patrol, how dignified he looks as he heads downtown with Officer Lukacs each day, and how various friends and neighbors come up to Liam in order to say “hello” and get a picture taken with him. (Yes, he is the George Clooney of horses.) The book even shows a memorable pic of Axel and Liam greeting each other before the K-9 goes off to work with his own partner, Officer Alexander. When it comes to large events, like festivals, Liam shows you the huge benefits of being a horse and how he comes in more than handy when someone might get “lost in a crowd.” Because he’s much higher up than the regular walkers, he and his partner have the benefit of being able to see greater distances and find someone who may need help, while also being able to keep everything running smoothly. He even patrols at night! I have to say, as a reviewer who reads a great many books per year, I never thought it was possible to find the “Best of the Year” children’s book this early in 2019. But, after reading this and seeing the amazing pictures of Liam on duty and off, I may have done just that. This is a whole lot of fun to look at and a great deal of fun to share. My granddaughter read it just once and now will not put it down. She even wants Grandma to “find” Liam and put him in my backyard so she can play with him when she visits. Because he’s a police officer, I’ll have to explain to her that luring Liam to New Mexico will probably get me into trouble. To sum up, there is no better advice to give to readers everywhere than: Read This. Ellen Feld and photographer John Cebula have done an excellent job delivering the best of Liam. This book will not only make you want you to honor all officers every day, but it may just make you buy plane tickets to Pennsylvania so you can meet Liam face-to-face. Quill Says: An incredible book that will, no doubt, find its way onto every “Best of 2019” children’s book lists. When I Grow Up I Want to Be...in the U.S. Navy: Noah Tours an Aircraft Carrier! When I Grow Up I Want to Be...a Firefighter! Will’s Amazing Day! The Royal Treasure Measure: Math Is Fun!